No more sand, no more filling, easy to carry and store, always ready to use, easy to carry when wet. Sandbag replacement - sand free bags - gel self expands. Bags packed dry and stored flat. The 'sand' bags are stored dry, ready for immediate use. Speak to real flood people now on 01626 331351 - qualified staff can provide immediate FREE advice. Telephone calls are at normal, national call rates. Soak in at least 10 litres of water per bag, by hose, in a sink, bath or flood, until expanded. 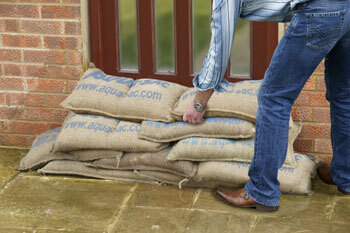 Ultra Sack is a revolutionary direct replacement for the traditional 'sand' bag: it is stored flat ready for instant flood defense. No more sand, filling or weight problems. 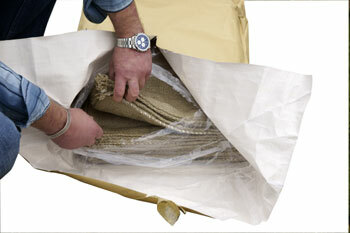 The bag is made of high quality woven Jute lined with cotton, which are natural, renewable materials. The gel is an inert granulated product commonly used as a soil expander - it has no effect on the environment. 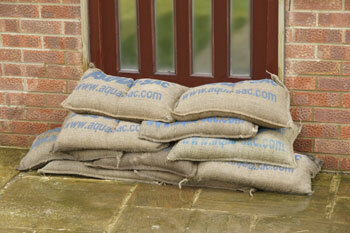 Make a pile across the doorway - keep a few dry ones to soak up any water that leaks through. 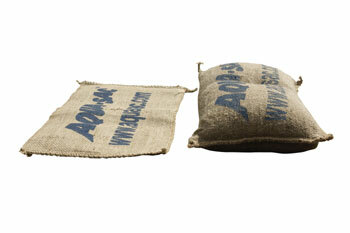 Bag Expansion - requires a minimum soaking with at least 10 litres of fresh water to expand to capacity. Use a garden hose, a bath, sink, wheelie bin or other receptacle to allow full soaking. Note - it is normal for a small amount of inert Gel to reach the bag surface, making it feel slightly sticky. This is harmless and does not reduce its efficiency. "Hi from Badgers Sett and the Chattabox Childrens Holiday Club. A lady in your organisation asked me how the Aqua Sacs worked out. Well, we have finished this years Holiday Club in the 140ft marquee in some rather wet weather and occasional cloud bursts. In previous years such weather would have caused some flooding in the marquee but thanks to your sacks this year was O K.
As soon as there was any surface water coming under the edges of the marquee we put a row of bags along under the flap of the sides which diverted the water. We also used a few to act as sponges for any wet patches within the Marquee that escaped the side barriers. All in all "it did what it said on the tin." which often needed trenches to be dug to prevent water ingress! So I think you have a market with all the marquee companies, it certainly solves the problem if the marquee is on hard standing or high quality grass where one cannot trench. Regards David Macey of Badgers Sett"
Use any of our Shopping Pages to place goods in your Shopping Basket. They all use the same Shopping Cart system.